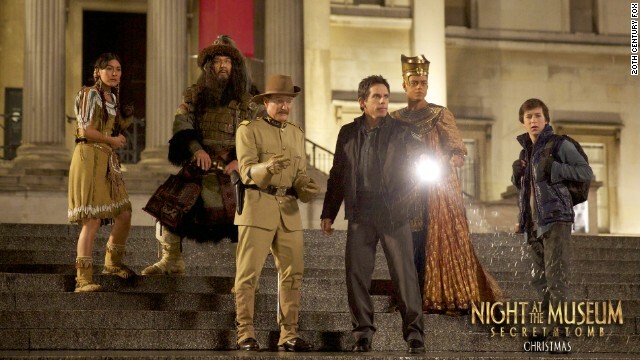 Robin Williams (foreground, left) and Ben Stiller (foreground, right) return for a third "Night at the Museum" movie. The clip arrived at the same time as trailers for "Avengers: Age of Ultron" and "Insurgent"
(CNN) -- With the new trailer for "Night at the Museum: Secret of the Tomb," we get a glimpse of Robin Williams in one of his final roles. "Secret of the Tomb" is the third movie in the "Night at the Museum" franchise, and it's one of the four completed projects Williams left behind when he died in August. The third "Night at the Museum" sees Ben Stiller return as a night security guard at the American Museum of Natural History. This time around, the magic that helps bring all of the museum's historical figures and creatures to life for those raucous adventures is in danger of running out. Williams starred in the family movie franchise from the start, portraying former President Theodore Roosevelt. "Night at the Museum: Secret of the Tomb," which also stars Owen Wilson, Ben Kingsley and Dan Stevens, opens December 19. After that, there's "Avengers: Age of Ultron" and the "Divergent" sequel "Insurgent" to look forward to in 2015 -- and both now have new trailers. On Wednesday, eager fans were treated to an extended look at "Avengers: Age of Ultron," which opens May 1. If the trailer Marvel released in October didn't give you enough chills, James Spader's opening cackle as the psychotic villain Ultron will probably do the trick. On the "Divergent" front, Wednesday also brought our first look at the second installment of the film series, which is adapted from Veronica Roth's best-selling young adult books. With "Insurgent," Shailene Woodley's Tris Prior is no longer learning the ropes of what it means to be in her daredevil faction. In the aftermath of the first film's heartbreak and loss, a fugitive Tris has cut her hair down to a pixie and is clearly still fighting to defeat Kate Winslet's cold and calculating Jeanine Matthews. If you haven't read the books, the first look at "Insurgent" isn't going to fill in any blanks. Not to worry; with that movie due out March 20, there are plenty of other trailers to come.